The research firm's latest U.S. Mobile Subscriber Market Share report for January 2012 was issued this week, revealing that Apple's iOS gained 1.4 percent market share between October of 2011 and January of 2012. That put Apple in second place, behind Google's Android which grew its U.S. market share 2.3 percentage points in the same period. Android, which is available on all domestic carriers with a wide range of handsets from multiple manufacturers, controls 48.5 percent of the market. Apple's lineup of three iPhone models put it in second place with 29.5 percent of the market. In third was Research in Motion, which saw its market share drop 2 points to 15.2 percent. Microsoft also lost more ground, dropping 1 point to 4.4 percent and fourth place. Rounding out the top five was Nokia's Symbian platform, which lost a tenth of a point. The Finnish handset maker accounted for 1.5 percent of total U.S. smartphone subscribers ages 13 and up in the three-month period ending in January. The number of U.S. smartphone subscribers topped 100 million in January, up 13 percent since October. 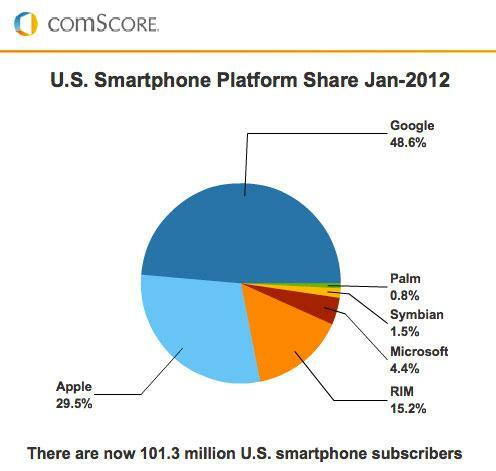 There are now 101.3 million smartphone subscribers in America, comScore said. In terms of total hardware sales, with combined smartphone and "feature" phone sales, Samsung was the leader, accounting for 25.4 percent of all devices in use in the three-month period. Apple, which only makes smartphones, represented 12.8 percent of the market, an increase of 2 points from the October quarter. Between Samsung and Apple are second-place LG, with 19.7 percent of the U.S. market, and Motorola, taking 13.2 percent. All of the top three saw their market share slip in January 2012, while Apple was the only company in the top five to gain ground. comScore's study surveyed more than 30,000 U.S. mobile subscribers. It also found that 74.6 percent of mobile subscribers use text messaging on their device, while 48.6 percent have downloaded applications, and 48.5 percent use a browser. Another 35.7 percent accessed a social networking site or blog, 31.8 percent played games, and 24.5 percent listened to music.